For most of my life, I have danced a form of ritual English dance called Morris Dancing. 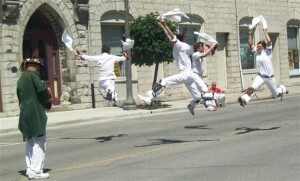 This traditional dance is a centuries-old tradition whose performance has always been associated with social gatherings in the village square and the local pub. While the figures and phrasing of the dance are meant to honour and to symbolize the perennial nature of life’s cycles, the sense of community created in the annual performance of these rituals are intimately entwined with the fabric of the communities in which the Morris was danced. Alongside this tribute to a bygone age of simplicity, beauty and camaraderie comes an appreciation for some of life’s simpler joys: hearty friendship, lustful song and dance, and a pint that’s always brimming with a fine brew.